Fabric Fedora Hats pack a lot of style. They are not as hard as felt fedora hats so they can be rolled and smashed without losing their structure. The best thing about these hats is that they are perfect for everyone. Check our collection of Hats. Featuring a pinched crown and soft brim, the Fabric Fedora completes any outfit looking for a touch of classic style. First coming to light toward the beginning of the 20th century, the fedora was first famous among women and was a symbol of the Women’s Rights Movement. In just a few decades afterward, the Fabric Fedoras also became popular with men, emitting stylishness and functionality. The classic hat has transcended both decades and groups in popular culture: it has been a symbol for men; women; Prohibitionists; hipsters. Not only is the fedora famous in fashion, but it is also ideal to wear in windy or cold weather. The hat is made of fine fabric, such as wool or cotton, and keeps the wearer’s head warm, snug, and comfortable. The Fabric Fedora comes in different colors and also often features ribbon around the crown, adding texture and thus further increasing the great hat’s appeal. Fedora hats are made from fine materials. They not only look sleek, polished and elegant but also comfortable. They are timeless pieces of headwear that everyone should have in their wardrobe. Whether you are a fashionable adult or youth, you will be able to wear one. Check our collection of Fabric Fedora Hats. 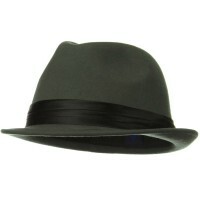 If you are looking for Classic Fedora Hats, you can always opt for the Pork Pie Hats that has a unisex appeal. It comes with an elastic tie so that you can secure it in place despite strong winds and movement. Contrary to what most people think, fedora hats are not only limited to men. These days, there are many designs of fedora hats that are intended for women. Want to wear a Feminine Fedora Hat? You can always go for Patterned Fedoras and they will pair well with any outfit. For young girls, you can get the Ear Crown Fedora Hat that has cute accents any girl will surely love. Other designs of Fedora Hats include those for young boys, teens, and basically anyone who is in need for a hat.